A mineral is a naturally-occurring, solid, inorganic, crystalline substance having a fairly definite chemical composition and having fairly definite physical properties. At its simplest, a mineral is a naturally-occurring solid chemical. Currently, there are about 5400 named and described minerals - about 200 of them are common and about 20 of them are very common. Mineral classification is based on anion chemistry. Major categories of minerals are: elements, sulfides, oxides, halides, carbonates, sulfates, phosphates, and silicates. The silicates are the most abundant and chemically complex group of minerals. All silicates have silica as the basis for their chemistry. "Silica" refers to SiO2 chemistry. The fundamental molecular unit of silica is one small silicon atom surrounded by four large oxygen atoms in the shape of a triangular pyramid - this is the silica tetrahedron - SiO4. Each oxygen atom is shared by two silicon atoms, so only half of the four oxygens "belong" to each silicon. The resulting formula for silica is thus SiO2, not SiO4. The simplest & most abundant silicate mineral in the Earth's crust is quartz (SiO2). All other silicates have silica + impurities. Many silicates have a significant percentage of aluminum (the aluminosilicates). 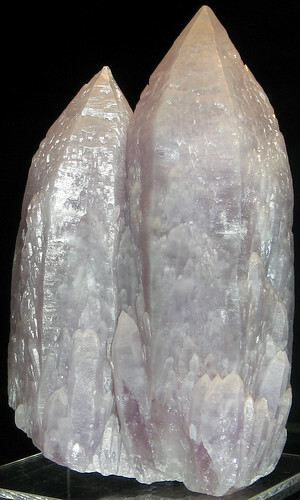 Quartz (silicon dioxide/silica - SiO2) is the most common mineral in the Earth's crust. It is composed of the two most abundant elements in the crust - oxygen and silicon. It has a glassy, nonmetallic luster, is commonly clearish to whitish to grayish in color, has a white streak, is quite hard (H≡7), forms hexagonal crystals, has no cleavage, and has conchoidal fracture. Quartz can be any color: clear, white, gray, black, brown, pink, red, purple, blue, green, orange, etc. 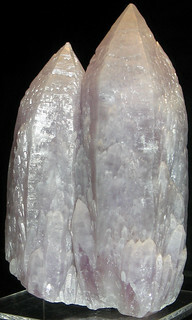 Purple quartz is called amethyst. The coloring agent for amethyst is not agreed upon. Some workers say that it is due to Fe+4 impurity, some say the impurity is Fe+3, and others say it is Mn.